Patriotic-themed party invitations can generate a lot of excitement and enthusiasm in your would-be guests, so make sure you choose designs that help set the tone for any kind of patriotic party you plan to throw. 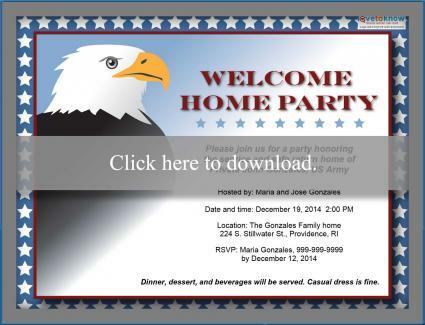 Customize and print invitations yourself, or learn where to find more invitations to fit nearly any patriotic theme for your next party. Downloading and customizing any of the these invitations is easy to do. Just place your cursor on the invitation you want and click. Click anywhere on the text to change the info to your own party details. You can save your changes by clicking on the diskette button. Give your invitation a thorough proofreading to check for any typos or omissions, and click the printer icon when you're ready to print. 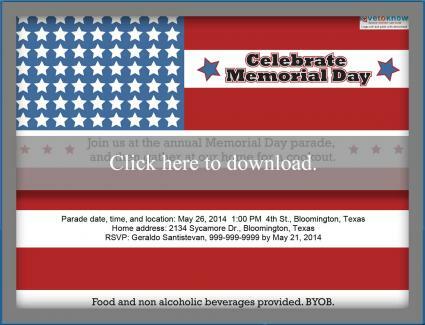 Many cities hold parades and fireworks displays that you could plan your own Memorial Day party around, and this invitation provides a fun and easy way to spread the word. A 4th of July party is often the highlight of summer. The festive, patriotic design of this party invitation sets a tone that promises a good time for everyone. Celebrate the patriotism and sacrifice of a returning service person by throwing a welcome home party in his or her honor. 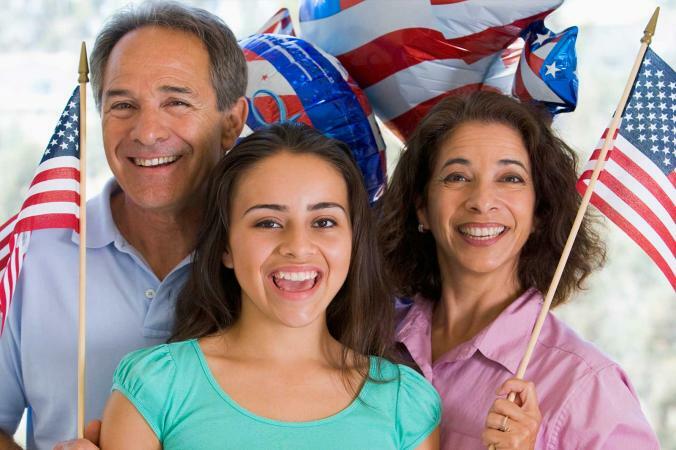 Zazzle.com offers personalized invitations for 4th of July, Labor Day, election parties, and various military occasions, including send-offs, welcome home parties, and retirement parties. Most invitations are in the $2 range, and you can choose the type of paper your invitations will be printed on. Envelopes are available for an additional fee. 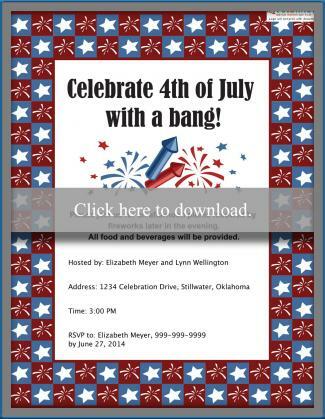 ImpressInPrint.com offers about six pages worth of invitations with patriotic designs. Most average around $2 per invitation, but some are priced higher or lower. You have the option of using your own wording or choosing one of the company's suggested verses, and you can also customize the color and font. Orders of $75 or more receive free shipping. AnnouncingIt.com has a number of exclusive and unusual patriotic invitation designs that you won't find anywhere else, include a flag-motif grunge guitar, a beer keg, and a tipsy Uncle Sam with a celebratory cocktail in hand. You can personalize your invitation and select the font style and color. Prices start around $40 for 20 invitations. It seems that almost everyone is online these days, so sending invitations via the Internet is a popular option that also saves paper and postage. Evite.com has many patriotic designs to choose from, including party invitations for Memorial Day, Labor Day, and Independence Day. Simply click on the invitation you want to use, and fill in all the formation fields with your details. All of their invitations are free whether you send or receive one. Pinggo offers online invitation collections for the 4th of July and Memorial Day. Since these invitations are fully customizable, you can choose the basic design you want and designate it for whichever kind of party you want to throw. Choose an invitation from their collections, and you can send it to up to 75 recipients at no cost. Whichever patriotic event or holiday you want to celebrate, there are enough invitation designs available to satisfy just about anyone. Start planning your party well ahead of time so you can browse around for great invitations, get your wording just right, and send them out with plenty of lead time for your guests to add your party to their social calendar. With that task out of the way, you can focus on creating a party that really shows off your red, white, and blue spirit!